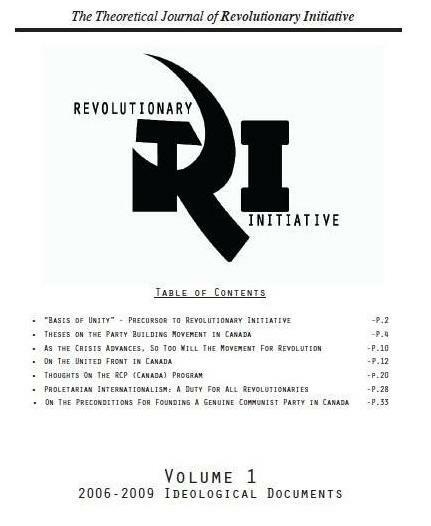 [RI Editorial Note: The following article, forwarded to RI, contextualizes the rise of the Red Power movement in Vancouver in the mid-to-late ‘60s, describing the influence of the historical conjuncture on the ideology and politics of the movement. 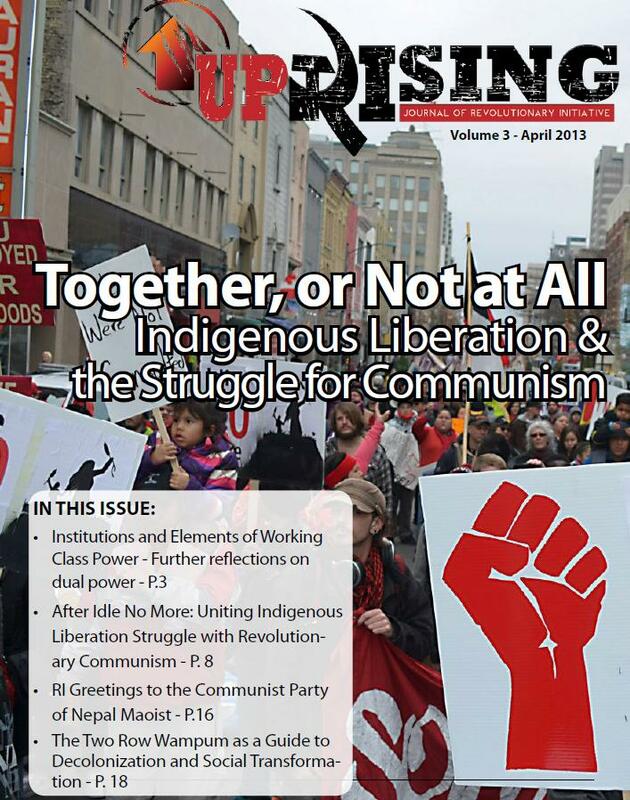 The article describes the influence of the Great Proletarian Cultural Revolution in China and the rise of the Black Panther Party; how the Red Power movement dealt with the Trudeau government’s efforts to co-opt native leadership into Canadian imperialism; and how they engaged the reemerging native traditionalism of the time with a progressive and revolutionary nationalism. The article also details the challenges faced by the Native Study Group given most members “did not have grade twelve” education, as well as the effects of the counter-revolutionary reversal in China after 1976, just after the Native Study Group had itself visited China. Some of the challenges recalled by Ray Bobb pose questions for the revolutionary tasks facing us today . What is the relationship of that section of the proletariat that also constitute the internal colonies of Canadian imperialism? Bobb holds the position that natives in Canada constitute an Indian nation and are an internal colony of Canadian imperialism, an historical product of settler-colonialism that the Canadian state has been trying to do away with since the Trudeau White Paper of 1969 attempted to liquidate the national question and assimilate natives into Canadian society. The most recent First Nations-Canada Summit in January 2012 is only the most recent attempt at liquidating the land base of indigenous people, by pushing the municipalization and incorporation of native lands into capitalist relations of exchange, thereby alienating the land from the collective ownership of indigenous peoples (see Bobb’s other piece “Indian is not a Four-Letter Word”). Bobb’s position on the Indian nation is complimentary to our own developing position: which is that the national liberation project of indigenous people in Canada – whatever specific form it takes – both requires and is required for genuine proletarian revolution in Canada i.e. to defeat the Canadian imperialist bourgeoisie. If as Bobb suggests, the Indian Nation requires strategic alliance with the rest of the Canadian proletariat, we would underscore the point that the Canadian proletariat cannot defeat the imperialist bourgeoisie without a revolutionary united front with the national liberation project of the indigenous peoples and nations (or the ‘Indian Nation’) who constitute a very important and very militant section of the proletariat. A socialism that would continue to plunder native lands would be no socialism at all. Plunder of the North allows for the Canadian imperialist bourgeoisie to continue propping up a shrinking but shifting aristocracy of labour with its imperialist and colonial “good jobs”, especially in Alberta, but also in many other parts of the country, such as with Quebec’s new ‘Plan Nord’. What follows is a short analysis of the activity and thought of a small group of native Indian activists that existed in Vancouver from 1967 to 1975. While there might be some value in reading political analysis of the group’s existence there is no particular value in reading a catalogue of the group’s activity because the group’s activity did not differ from other movement activism of the time. However, in order to give the reader a practical picture of the group, some of the group’s activities will be listed below. This will be followed by a characterization of the world context of the time. And by an explanation of Maoism because very early this became the theory that the group adopted and tried to develop. While it may seem that this presentation is about things other than natives, for a very small people survival analysis must mainly be concerned with other things. In the period of its existence the group engaged in protest activity against local residential schools (Mission and Sechelt), police brutality, racism, sexism and the Vietnam War. The group engaged in solidarity work, primarily in respect to the struggles in southern Africa. The group engaged in fishing rights struggles on the Nisgnally River in the State of Washington. The group engaged in land occupations of Fort Lawton in the State of Washington. The group maintained a community hall in the poor section of Downtown for educationals and fundraising. The group published a monthly newsletter for movement news and discussions. The group engaged in the agitation of reactionary political events. In 1967 the world situation can be characterized by five conflicts. (1) The Cold War: The Cold War between the US and USSR superpowers could be seen as a class contradiction in the world bourgeoisie or as inter-imperialist rivalry. This rivalry took place primarily in the third world. (2) The Vietnam War: The Vietnam War could be seen as the main expression of the fundamental class conflict in the world. The Cold War also influenced this conflict. (3) The armed struggles for national liberation in the third world. These conflicts, of which there were more than forty, are of the same category of conflict as that of Vietnam except that in these conflicts imperialism had no yet intervened directly. (4) The Sino-Soviet split. The Sino-Soviet split broke up the “formidable” communist camp in the world that had existed for over a decade. China condemned the USSR as social-imperialist after the USSR tried to dominate China by means of a military pact. The Chinese and Soviet Community Parties had long been engaged in internal polemics on the international communist movement. The Chinese also claimed that the USSR had revised and derevolutionized Marxism to suit its own objectives in the world, e.g. the “peaceful road” to socialism. (5) The Great Proletarian Cultural Revolution in China. The cultural revolution was a mass, radical movement initiated by Mao to topple the “capitalist roaders” in positions of power and to prepare the country for possible invasion from the USSR in the north or the from the US in the south. The five conflicts in the world gave rise elsewhere to (1) the peace movement, (2) the anti-war movement, (3) the solidarity movement, (4) division on the left, and (5) the popularization of Maoism. The core of Maoism is the countryside-encirclement-of-the-city strategy for revolution developed by Mao in the course of the Chinese revolution. Liberated areas were established in the countryside and, in a protracted process of people’s war, expanded to surround the cities which were taken relatively quickly. This strategy viewed the cities as strongholds of bourgeois power. The theoretical basis of Mao’s strategy was the recognition that in China the main force for revolution was the poor and middle peasant class. In 1965, Lin Piao, minister of defence, stated in “Long Live the Victory of People’s War” that (paraphrase) if Mao’s strategy was applied to the world Asia, Africa and Latin America would be the “countryside” areas while North America and Europe would be the “city” areas. Maoism, then, implies a class analysis of, and a strategy for revolution in, world capitalist society that takes into consideration that imperialism has divided the world into oppressing and oppressed nations. Lin Piao’s application of Mao’s strategy to the world implies also that imperialism will have to be weakened by victories of protracted people’s war in the third world before conditions can re-emerge in the advanced capitalist countries for class war. The re-emergence of conditions addresses the temporary and conditional nature of the concessions afforded by the imperialists to “their” workers in the attainment of class peace at home and maintenance of superprofits from the third world. Material concessions are the product of reformism the effect of which, in the imperialist countries, is the acquisition of petty-bourgeois characteristics by the working classes. Until the time when petty-bourgeois characteristics on one side of the world disappear due to the victories of people’s wars on the other, progressives in the imperialist countries must oppose reformism with proletarian internationalism, i.e., the subordination of the material interests of the workers in one country to the interests of the struggle on the global level. By addressing this problem of reformism, Maoism is more than third world marxism. It is the qualitatively more developed Marxism of our time. The group of native activists was formed by a couple of native women in Vancouver who called a meeting in 1967 to discuss a court case in Williams Lake. This case concerned, on the one hand, a native woman who had been brutally raped and murdered and, on the other hand, three settlers who got away with it. Seeing no recourse for this and other injustices, the meeting participants formed a protest group. The group members despite having no background or involvement in politics became very early on sympathetic to radicalism. This happened for two reasons. On the one hand, there was a vacuum of political movement and leadership in the native community even though the government was oppressive. On the other hand, there were many models of resistance in North America and Vancouver, and the group learned from them. Indians, although a much smaller people than the black people in the US, experienced similar conditions and political development. By 1967, the black people had already been through intense struggle in order to be allowed to vote. Indians were legally allowed to vote federally in 1960. In more recent years many more black people were killed in race riots that occurred in the large cities of the US. A black militancy had developed typified by black power, Malcolm X, the Nation of Islam, black revolutionary unions and the Black Panther Party (BPP). In 1967, the American Indian Movement (AIM) did not yet exist so the black movement in the US became the main role model for the group which called itself the Native Alliance for Red Power (NARP). With Panther approval, NARP adopted the ten point program of the BPP. In Vancouver, the left organizations that led the peace and anti-war movements were also role models for NARP. The BPP saw its people as an internal colony of imperialism. The BPP had recently evolved from armed self-defence to the concept of black revolution. NARP’s concept of its people changed from them being victims of racism to them being an internal colony of the Canadian imperialist settler-state. Further, although the BPP was not a maoist organization, its members had a high regard for the Chinese revolution, its leader and his teachings. China was not recognized by the world powers (Taiwan was) and had very few embassies. China compensated by disseminating highly subsidized propaganda world-wide through friendship associations. This material popularized the classics of Marxism, Mao’s writings and the national liberation movements in the third world. Maoism, further, appealed to Indians and blacks because they had a history or being badly treated by the “the whites” and could not readily identify with Euro-marxism or the objectives of the white working class. On the question of arms, NARP greatly admired the BPP and AIM. Both organizations used armed tactics. NARP did not agree with the immediate use of violence in North America but did no propaganda against it. NARP disapproved of the use of armed tactics in North America because NARP thought it to be suicidal to do so at this time. It is likely that, due to the large population of black people in the US, the BPP saw arms as a viable option. Similarly, AIM did not advocate armed struggle but only armed self-defence. NARP, also, disagreed with armed tactics in North America because, theoretically, it was not part of the maoist strategy for world revolution which posed a later historical time line for uprisings in the imperialist countries. On the question of re-emerging traditionalism, NARP thought it to be beautiful but that out of the context of progressive nationalism, it could be used to foster political backwardness and tribalism. In 1969, the Trudeau government intervened in Indian political and social affairs by ushering in unprecedented social reforms to the native communities and began funding a native political leadership. These momentous reforms had the effect of changing the character of native politics from grassroots activism and protest to bureaucratic reformism and negotiation. Narpers disbanded in 1970 for almost one year. In this period former Narpers engaged in and then sabotaged a federal government effort to create a captive organization representing the native youth of BC. After a summer of organizing potential representatives from BC Indian bands, a conference was held in Sardis that was to be the founding conference. Much discussion occurred instead about the government co-optation of native leaders. The participants rejected government funding and marched to the Fraser River where they harvested salmon “illegally” under the eyes of fishery officials and the RCMP. In 1971, former Narpers formalized the Native Study Group (NSG) with the mandate of creating revolutionary theory to the level where by an organization could be formed to do conscious revolutionary work. The mistaken notion of theory-first came from NSG having misunderstood Lenin when he said, “Without a revolutionary theory there can be no revolutionary movement.” To NSG, this meant that the creation of revolutionary theory comes before engaging in revolutionary practice. To NSG revolutionary theory was a vast undertaking not only because NSG was unqualified to do it but also because it was a task of some proportion. If, for instance, one is speaking of a world revolution of two stages made by two different labouring classes, what is the second stage? What are these classes in terms of the Marxian conception of the proletariat? What is relationship of the class of the second stage to the strategic objective of the first stage? Most NSG’ers did not have grade twelve. 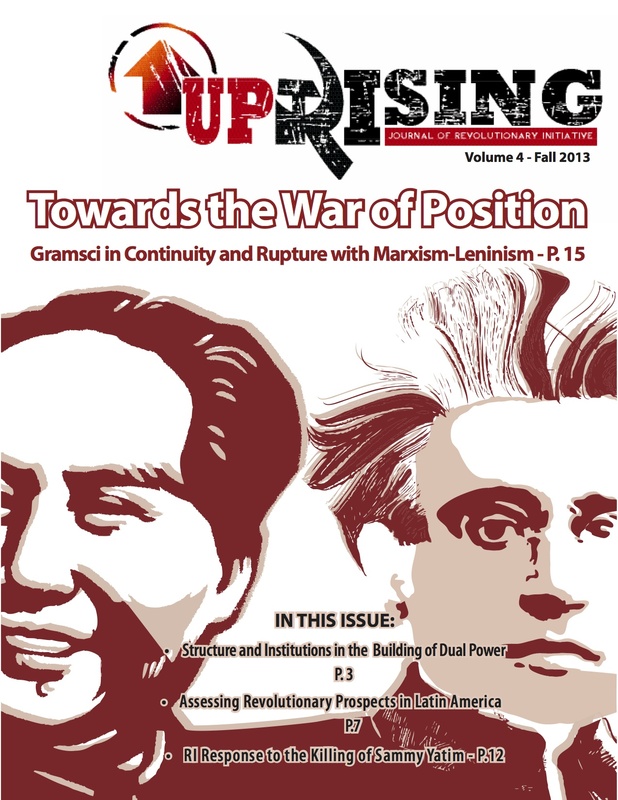 NSG’s misunderstanding of Lenin’s statement led them not to revolution but to academia. The fact of the matter was that in the 1960s and early 1970s, revolutionary undertakings were already in progress in the third world that were defining social change on earth. NSG should have made immediate, positive and practical association with them, from here in the first world. Things would have developed from there. Theoretical misconception was compounded by theoretical errors as NSG maintained an incorrect definition of the internal colony. Like some other non-white groups of the time (the BPP, other groups from the internal colonies and groups of third world immigrant origin), NSG identified as being completely a part of the third world. This, in spite of the obvious fact that the members of all the internal colonies (African Americans, Mexican Americans, American Indians, Canadian Indians, Australian Aborigines and New Zealand Maoris) were also members of the working classes of imperialist settler-states. NSG, then, could not recognize that it’s members had to come to grips with petty-bourgeois faults – such as liberalism and political vacillation – before it could actively associate with revolutionaries in the third world. Radical consciousness can be a compelling factor but not if it is continually conflicted with the unconscious factors of petty-bourgeois conditioning. Further, on the definition of internal colonies: the African and Mexican internal colonies of US imperialism were products of slavery and annexation. Their populations are large. And their strategies may differ from that of the native internal colonies. The populations of the native internal colonies are very small and cannot achieve their right to self-determination and sovereignty by defeating the imperialist settler-states on their own. However, the dual condition of the internal colonies allies it both to the third world national liberation struggles which can give power to the native national question, and to the working classes of the imperialist settler-states with whose power the native internal colonies can negotiate independence. NSG associated with an organization called the Liberation Support Movement (LSM). LSM had a skeletal theoretical and strategic conception and yet it was associating actively with revolutionaries in southern Africa. LSM’s unit of analysis was the world. This is the correct unit of analysis because for Marxists the basis of a society is the economy which has been global since at least 1900. Even though LSM did not have an analysis of the classes in the world capitalist system it knew enough to see that the revolutionary classes existed at this time in the third world. LSM called the people who engaged in progressive activity in the imperialist countries “class eccentrics” because they came from a non-revolutionary class situation. LSM itself was composed of one professor and his family and a number of students and workers. LSM felt that because its support was founded upon principled leftism, and not liberalism, their members would one-day evolve into being comrades of the revolutionaries that they were supporting. NSG helped in some of the work of LSM. LSM did not espouse Maoism even though it supported movements in southern Africa that were effecting what were essentially maoist strategies (countryside-to-city bush wars) but that were materially tied to the USSR. Such movements claimed to be non-aligned even though they were not. Third world countries were often the scene of two movements. In South Africa for instance the African National Congress was tied to the USSR while the Pan African Congress adhered to Maoism. One factor in this evolving scenario was that China was a poor third world country while the USSR could materially contend with the US in the third world. While one might think that any kind of support would be good for third world movements, it was not always so. Some movements with the support of the USSR changed their tactics and began to engage in regular warfare. Another – Chile with Allende – attempted a peaceful transformation to socialism. Still other progressive forces in the third world were supported and became dominated by the USSR. This was possibly the case with Cuba. Guevara left under puzzling circumstances and he voiced the opinion earlier that support from the USSR should be free. Further, in regard to social-imperialism, there is a left tendency in every imperialist country that seeks class power but still feels entitled to a privileged position vis-a-vis the third world. In 1975, NSG visited China as part of a large delegation of natives calling itself the Native People’s Friendship Delegation to the People’s Republic of China. On the day that the US and its supporters fled from the roof of the US embassy in Saigon, the delegation was in Peking. There did not appear to be any celebration in Peking. 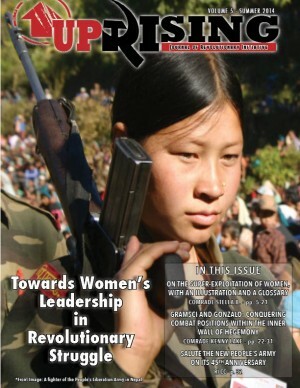 Narp/ NSG had long been reading about and inspired by the radicalism of China’s cultural revolution. It had no idea that after almost ten years of struggle, the cultural revolution was being defeated. Mao died in 1976 and shortly thereafter the “rightist” of the cultural revolution, Teng Hsiao-p’ing, took leadership and began reversing Chinese socialism. With the arrest of the so-called gang of four the counter-revolution was complete. With the end of the Vietnam War, the US could start rolling back the gains of the national liberation movements in the rest of the third world. Vietnam won a military victory but had been devastated by bombing on a level unseen before in world history. Like many other left groups and movements, NSG folded after the end of the Vietnam War. The Canadian imperialist settler-state will not rest until natives, as a people, are done away with. In 1969, Canada’s anti-Indian policy shifted from a cultural attack on Indians, as implemented in over one hundred years of Indian residential schools, to a political attack on Indian nationality. At that time, Prime Minister Trudeau announced the federal governments intention, in the White Paper Policy on Indians, of eliminating Indian nationality and forcibly assimilating native people into Canada. The banks and corporations wanted “certainty” for their “investments” as opposed to the position of native people which asserted native claims to land and the right of native people to self-determination. In 1973 the federal government’s Comprehensive Land Claims Settlement Policy was established as the basis for making treaties to resolve all native claims. For the purpose of this treaty making process Indian bands and native communities were declared to be nations (First Nations). In the past thirty-seven years, the native people on almost one-half of Canada’s land area have made treaties, i.e. natives in the whole of Canada’s north including northern Quebec and many areas of Canada’s south. The two requirements of the treaty process are (1) that native people remove themselves from the jurisdiction of the Indian act thereby renouncing any national identity separate from that of being Canadian and (2) that they formally incorporate into Canada on the level of a municipality or territory. It is possible, after another thirty-five years, that the federal government will have made “modern-day” treaties with all the native people of Canada. This because (1) native leaders are paid with government money and are therefore required to carry out government policy and (2) treaty payments are money and resources that rightfully belong to native people and that are being purposely withheld by government in order to force native people into making treaties that are fraudulent on the national level, and on the international level a violation of native people’s human and political rights. The success of the treaty process will not only give business free access to native resources but also make it much more difficult for the native internal colony of Canada to assert its right to genuine self determination. I think you made a grammar error. Relationship to what? To Canadian imperialism or to the proletariat of the oppressor nation? In any case, the way the question is posed presents a view of contradictions that is quite flat. Internal colonies do not constitute a “section of the proletariat.” They are oppressed nations that have their own class structure, distinct from that of the oppressor nations. Many were never proletarianised to begin with and actively resist being brought into the proletariat of the oppressor nations by exercising their treaty rights to hunting and fishing rather than becoming dependent on wages from capitalist enterprises. 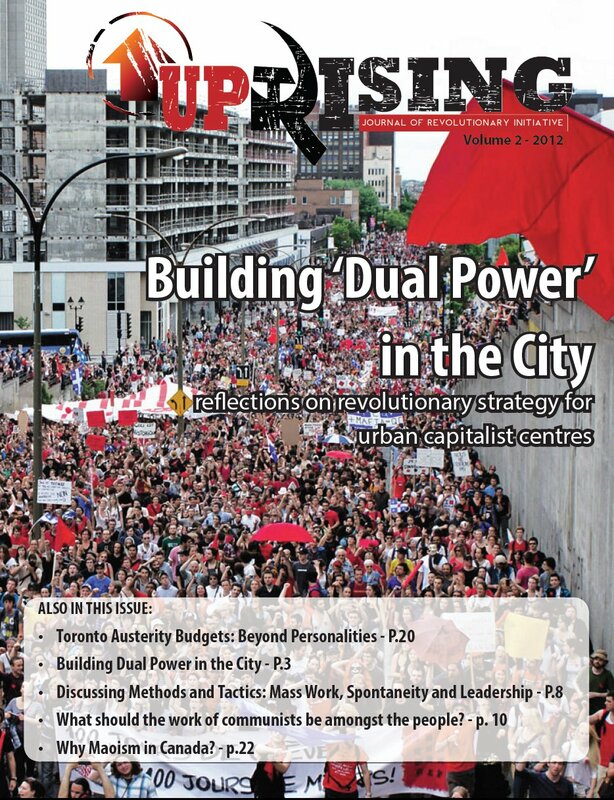 The contradiction they face with Canadian imperialism is based on nation (specifically between oppressed and oppressor nations), a contradiction that while not independent of class has a relative autonomy from it. On the other hand, there are increasing numbers of indigenous people (especially youth) that are leaving the reserves and treaty territories and migrating to the cities where they are either lumpenized or incorporated into the English or French proletariat (or are they?). Is the oppression they face taking more of a racial than national form? If that’s the case then does that change the how they would be organized?